Who's ready for the December Release from YNS???? It's time for the New Release Blog Hop and we have a $25 YNS GC up for grabs.. Just hop along below and leave a comment on each of the DT's post including the YNS blog for a chance to win! My first project uses the new set Java Geek and the coordinating dies. This set is perfect for all your coffee lovers out there!! There's also an iced and Frap coffee image in this set! My second card using the fun set Snow Much Joy and coordinating des.. I used my Copics and a White gel pen to add some snow to the trees and a fun Northern Lights background. This set is filled with great sentiments for all occasions and a super cute snowman!! So are you ready to Hop???? Don't forget to leave a comment for a chance to win a GC to the YNS store..
Love the Coffee fun, cute addition of googly eyes and cute spectacles:) And beautiful winter scene created! So beautiful cards, love the colors and design.! great cards, beautiful coloring on the snow scene! Adorable projects!! I love your style!! Regards. Beautiful cards! The little pink glasses on the coffee cup is adorable! So cute! Those pink glasses are adorable! Great cards! So adorable! I love the Snow Much Joy set. I"m a sucker for cute critters! I love your winter wishes card! Your java geek and darling sledding critters make me smile! You've showcased a few of my favourite things most wonderfully! Thank you! OMG....I smiled and laughed with delight at your first card! How much fun! And I really like the scene to created with the 2nd card. Very nice! the snow scene is darling. The eye chart is fun idea. Wonderful cards with these great new stamps. great stamp sets--love the snow scene and those pink glasses are toooo much! These are both fabulous designs and great images! OMGoodness, your cards are so adorable and cute! 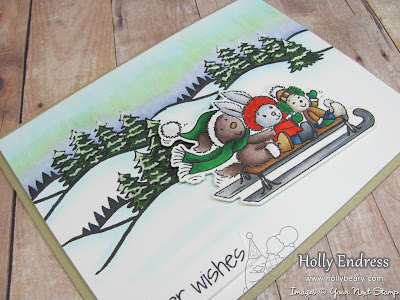 I especially love those sledding critters and the gorgeous scene you created! Both are great cards Holly but your second one is totally adorable! I LOVE the entire scene you have created and your colouring is just amazing! I want that set...BIG TIME! LOL TFS! Oh my! 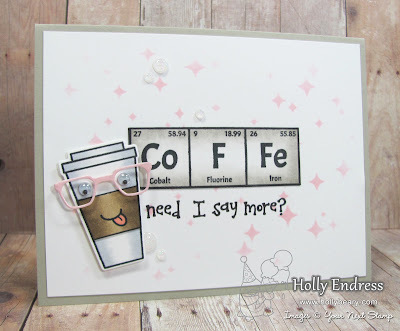 Love the little coffee geek and those pink glasses are so very cool! Great scene and I love the glasses on the coffee cup! Such fun cards, especially the coffee card - hilarious! Super cute love Java geek. Those critters on the sled are too cute. Wonderful cards Holly! The sky shading looks great and those glasses make me smile! I love how you stamped the treed hillside several times. It gives the card great dimension! Wow, I really love that snowy scene card! 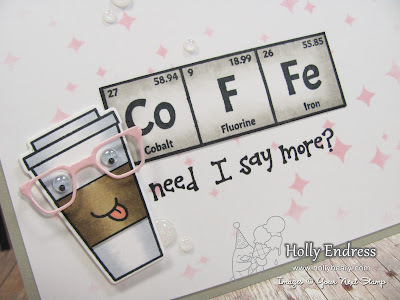 So, so, so, so, so much in LOVE with that COFFEE CARD!!! It is so cute!!!! 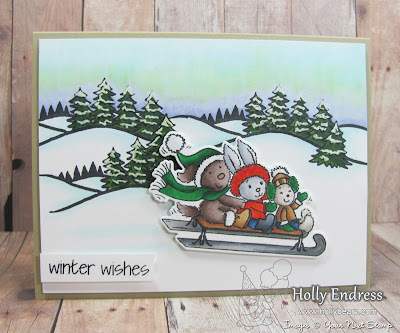 And the winter scene card is gorgeous - GREAT JOB, my friend!! Both cards are really cute! That coffee card is sooo adorable!! Oh, my goodness. I love the glasses and the googly eyes!